Kimberly Reed wants everyone to know how much she and her family love Mya. 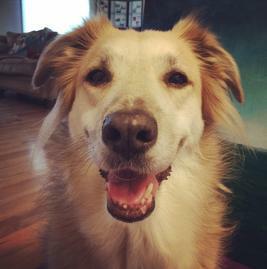 They adopted this six year old Australian Shepherd/Golden Retriever mix last fall. Mya came from a home where she lacked proper socialization, so she was fearful at first. She now gets a walk every day, lots of car rides, lots of toys, and “so much love she doesn’t know what to do!” She’s one lucky girl.